The Seats of the Mighty. Being the memoirs of Captain Robert Moray, sometime an officer in the Virginia Regiment. Title: The Seats of the Mighty. 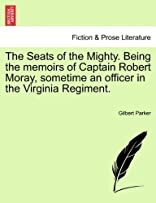 Being the memoirs of Captain Robert Moray, sometime an officer in the Virginia Regiment, etc. x. 376 p. ; 8�.